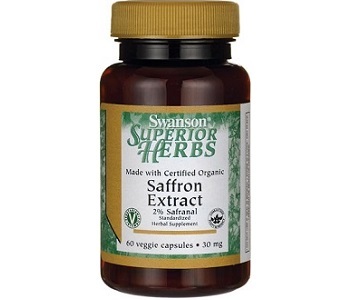 Today we review Swanson Saffron Extract Review. This supplement contains only organic saffron to help have the best results. Saffron can help improve your overall mood and make you feel happier throughout the day. This supplement only contains one main ingredient: certified organic saffron. The saffron comes from the extract of the Crocus sativus flower. Each capsule only contains 30 milligrams of saffron each, which is the lowest amount of saffron we have seen in any other similar supplements. This low amount concerns us about the effectiveness of this product. The manufacturer recommends taking two pills per day, once in the morning and once in the evening. Both pills should be taken with a meal. Even with taking two pills per day, you will still be taking much less saffron than in even one capsule of the other supplements we have seen though our research. The listed Manufacturer Suggested Retail Price for a 60-count bottle of this supplement is $22.09, while it normally sells for only $16.09. Right now, the manufacturer is having a sale, and the purchase price of this supplement is only $10.84. On top of the low price, there are also many discounts available. Free shipping is offered on orders over $50, and if you choose to set up an auto shipment of this product, you can receive 10% off and free shipping on the first order. While the low price is appealing, it also raises concerns. 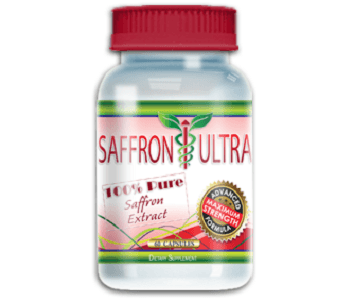 With saffron being one of the most expensive herbs available, having a low price for a supplement with pure saffron extract is worrisome. The manufacturer has no money-back guarantee listed on their website. However, they do have a return policy for their products. If within the first 30 days of receiving this supplement you are unsatisfied, you are eligible for a refund of the purchase price. We feel that only giving 30 days to try a dietary supplement does not give a long enough timeframe to actually know if the supplement will help. Also, while Amazon does list good star reviews, after reading what the customers had to say, we are unsure if this product actually works. Out of the 7 reviews on Amazon, 4 of them said they were still waiting for results and had not yet seen any improvement in their lives by taking this supplement. There are a few things we liked about Swanson Saffron Extract. First of all, this supplement only has one main ingredient, and that ingredient is saffron. We also liked that the saffron they use is certified organic. Unfortunately, there are many things that raised concern for us about this product. While the only ingredient is organic saffron, through our research, we have seen that this is the lowest dosage of saffron available when compared to other saffron supplements. Also, the manufacturer offers no guarantee on its products and only allows for returns within 30 days of purchase. Lastly, over half of the customer reviews stated that they were still waiting to see results from taking this product. For these reasons, we cannot recommend Swanson Saffron Extract to help increase your mood.